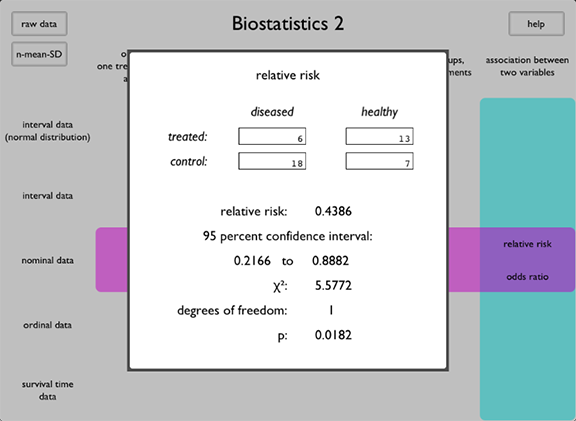 The Biostatistics app provides descriptive statistics and statistical tests and procedures of interest primarily to students and researchers in the life sciences. The provided tests and procedures may also prove useful to those in other fields who draw inferences about large populations from measurements taken from random samples. 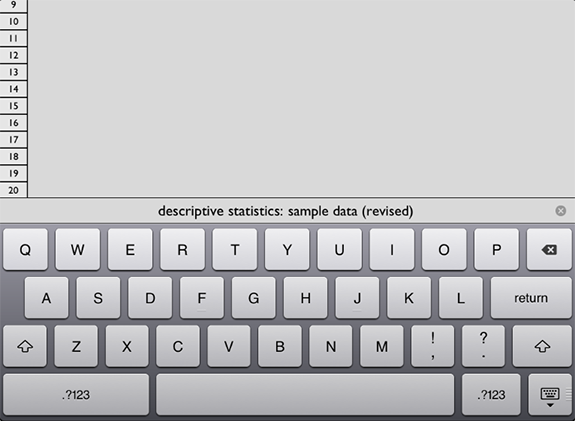 The Biostatistics app runs on the Apple iPad and is available for purchase in the Apple App Store℠. When the user taps the Biostatistics app icon for the first time, the app opens on the home page. One may access all of the app’s tests and procedures by tapping the “raw data” button or the “n-mean-SD” button the on the left side of the main page’s navigation bar. The “raw data” button presents procedure tools that accept actual experimental data. 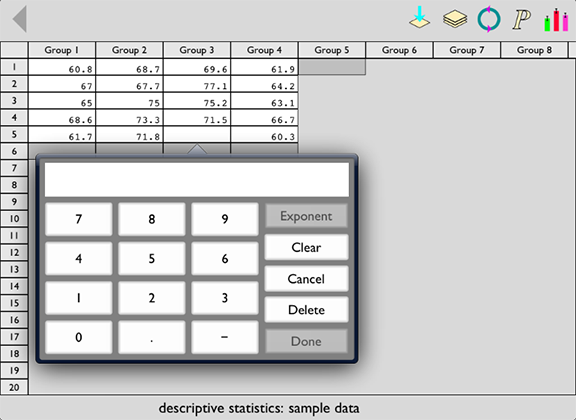 The “n-mean-SD” button presents procedure tools that accept summary data: the number of subjects, the mean, and the standard deviation. The currently implemented tests and procedures are listed in the drop-down menus in alphabetical order. Touching any item in the list causes the app to open the appropriate tool to collect the data in order to perform the chosen procedure. This tool is either a spreadsheet or a data entry form. Most of the main page consists of a table of labels intended to help the user choose the procedure that is appropriate for the experiment, given the nature of the data to be collected and the protocol to be followed. Along the left margin are headings for the four types of data typically collected in biological and medical research: interval, nominal, ordinal, and survival-time. You can access the labels relevant to a particular type of data by tapping the data type’s label. 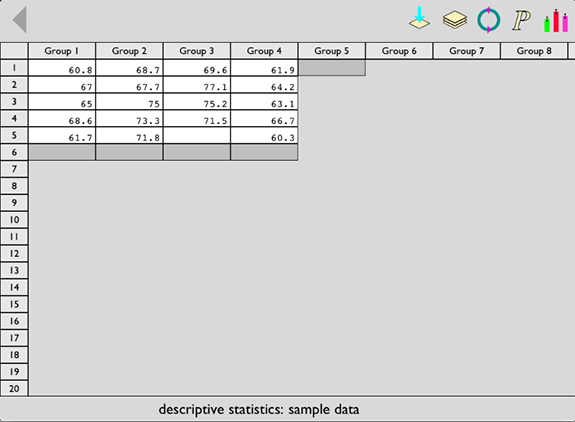 Along the top margin are headings for five types of research protocols commonly followed in biological and medical research: before-and-after measurements of the same group of subjects, multiple measurements of the same group of subjects, measurement of members of two different groups, measurement of members of more than two different groups, and measurements of two parameters on each subject in a group for the purpose of detecting trends (e.g., Is a subject’s blood pressure likely to be higher if his body mass index is higher?). You can also access the relevant labels by sliding the horizontal and vertical bars so that they are positioned below or adjacent to the appropriate labels. Double-tapping the procedure label that corresponds to the type of data to be collected and the type of protocol to be applied causes the app to open the appropriate data-collection tool for the procedure applicable to the experiment. For procedures that utilize a spreadsheet for data entry (e.g., the t test), the spreadsheet will display one or more cells in which the user can enter data. The user enters data by tapping one of the cells. When he does so, a number pad appears. The user enters the data for the cell in question by tapping the buttons on the number pad. In addition to the digits 0 through 9, the number pad displays various non-numeric keys. The keys appearing on the number pad depend on the nature of the data that can appear in the spreadsheet. For procedures that use data in the form of positive or negative floating-point numbers, the number pads non-numeric keys include a decimal point button, a negative sign button, and an exponent button. One may enter floating-point numbers either in traditional floating-point form (e.g., 123.45) or in scientific notation (e.g., 1.2345e+2). To clear the number pads number field, tap the Clear button. To delete that number already contained in a cell, leaving the cell empty, tap the Delete button. Tapping the Done button will transfer the number from the number pad to the cell. When you choose a procedure that utilizes a spreadsheet for data entry, the spreadsheet’s toolbar will identify the chosen procedure and will assign a name to the data set based on the current date and time. The user may change the name of the data set by tapping the name on the toolbar and entering a new name using the keyboard that appears. To return to the main page, tap the back button. To clear all the data in a spreadsheet, tap the reset button at the top of the spreadsheet. To paste data into a spreadsheet, tap the paste button at the top of the spreadsheet. The app does not have a copy button because the Apple iOS spreadsheet app, Numbers, uses some sort of proprietary clipboard format and pastes an entire Biostatistics spreadsheet into a single cell. To open a data set in Numbers, email it to yourself, tap the attachment to the email, and iOS will give you the option to open it in any installed iPad app that reads CSV files. 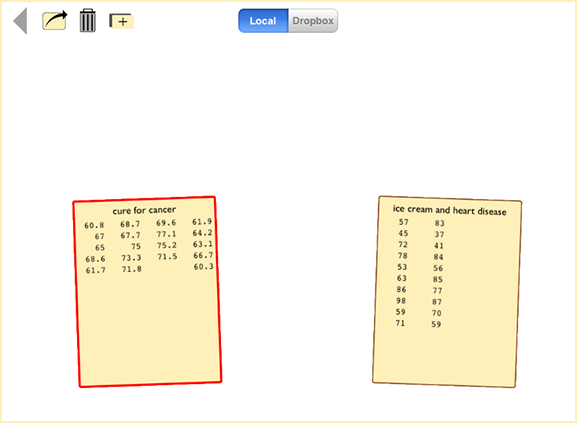 You can create a spreadsheet using the Apple Numbers app, copy the data onto the clipboard, and paste the data into a Biostatistics spreadsheet. One should be aware, however, of one limitations of the paste feature: Biostatistics does not know if the data pasted into a spreadsheet is appropriate for the kind of procedure being run. For procedures that utilize a form for data entry (relative risk and odds ratio), the displayed form will contain labelled cells in which the user can enter the appropriate data using the same number pad. When the user has entered data for each cell, the form will automatically display the relevant statistics in fields contained within the form. No further action is required to generate the desired statistics once the user has filled in all the fields on the form. For procedures that utilize a spreadsheet, the user must tap the compute button on the upper, right side of the screen in order to compute the desired statistics. When he does so, a report will appear. The action button gives the user the option to email a pdf version of the report or to save it in a Dropbox folder. (Look for “/apps/Biostatistics 2” in your Dropbox folder.) These actions facilitate printing the report on any printer connected to the recipient’s computer. To close the report, tap the back button on the upper, left corner of the report. If the procedure you are using provides a graphical display of your data, you will see a graphics button in the upper, right corner of the screen. 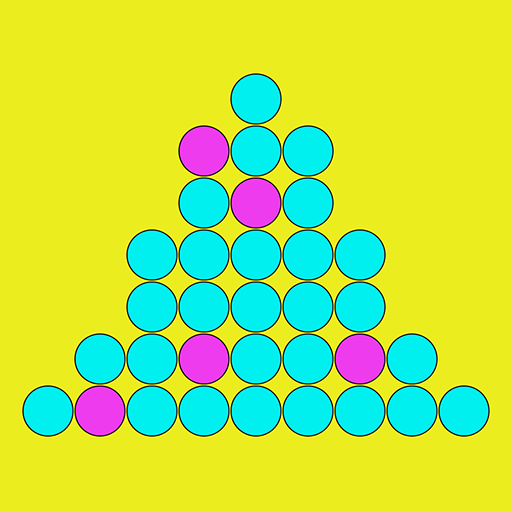 Tapping the graphics button reveals the groups of data displayed graphically. 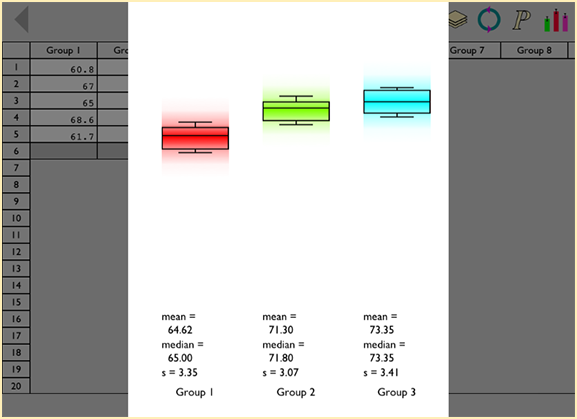 For most of the procedures, the graphics page will show a box plot superimposed on a color bar centered on the group’s mean and extending three standard deviations in both directions. When the user taps the data sets button at the top of a spreadsheet, the user will see a stack of all the data sets on the device. One may load the data from a data set item by double-tapping it. If you tap a data set item once, you select it, and three buttons will appear at the top of the screen. The copy button copies the data set. The delete button deletes the data set. The action button gives you the choice to email the data set or to save it in a Dropbox folder. The data set will be attached to the email or saved in your Dropbox folder as an “comma-separated-values” (CSV) file, which you can open in any spreadsheet program or text editor. You can flip through the stack of data sets by flicking the top card in the stack to the right to reveal the cards underneath it. To return to the spreadsheet, tap the back button. Feedback on the Biostatistics app is welcome. One can send email by clicking . You may also send feedback from within the app itself. On the main page tap the help button in the upper, right corner select “send feedback”. Version 1.001 corrected multiple popover and action sheet bugs. 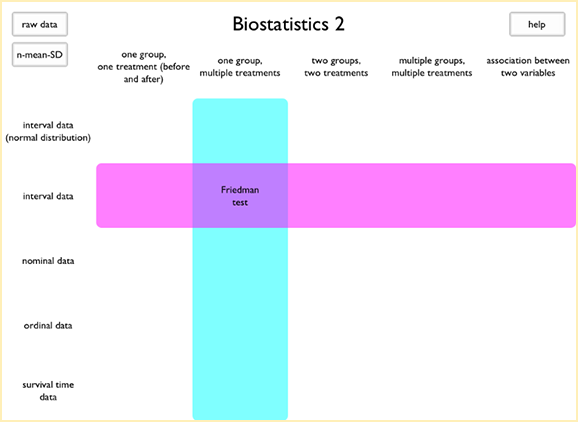 Version 1.002 enabled copying and pasting data between Biostatistics spreadsheets and between Biostatistics and other iPad applications and made minor changes to bolster the application&apos;s stability. Version 1.003 was recompiled against iOS 4.3.2 in the hope of eliminating an obscure bug that caused the app to crash on some iPads after updating to iOS 4.3.2. 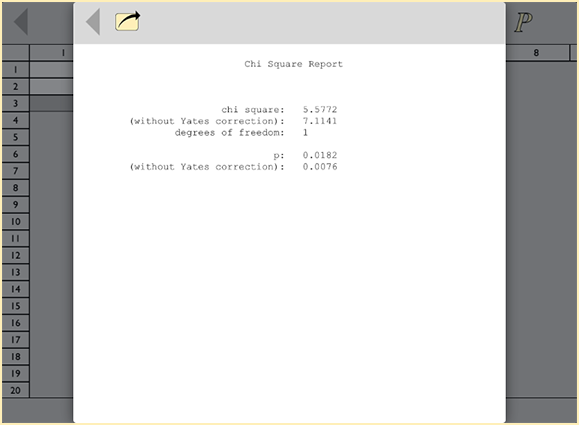 Also, Version 1.003 modifies the chi-square report for 2 x 2 arrays to show chi-square and p values with and without the Yates correction. Finally, Version 1.003 enables data set sharing though iTunes in the full version of the app. Version 2.0 entailed a complete rewrite of the app in Objective-C. (Previous versions were written in C# using MonoTouch.) Version 2.0 adds graphics for most of the procedures and multiple comparison procedures for the analysis of variance and similar tests. Version 2.0.1 fixed a minor bug. Copyright &COPY; 2013 Stephen S. Ashley. All rights reserved. The Biostatistics App and Biostatistics 2.0 are trademarks of Stephen S. Ashley. Apple is a trademark of Apple Inc., registered in the U.S. and other countries. iPad is a trademark of Apple Inc. App Store is a service mark of Apple Inc. IOS is a trademark of Cisco Systems, Inc., registered in the U.S. and other countries.